The Gerber Gator is a tough, field-tested fixed blade outdoor knife. It features the patented Gator Grip handle, which combines a durable glass-filled nylon core with a molded Santoprene rubber outer layer. The soft, textured rubber provides a comfortable and secure grip, and the lanyard hole allows you to tie it to your wrist for improved retention. The premium steel blade has a razor sharp plain edge and a sturdy gut hook at the tip, making it ideal for cleaning and skinning fish and game. Its full tang construction gives it the strength it needs for hard work. 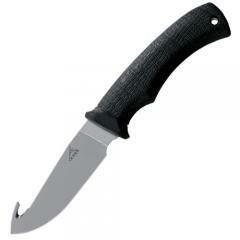 The knife comes with its own ballistic nylon sheath with a custom-molded plastic insert for shape retention.